• Size: 5/16" & 3/8"
Enjoy the benefits of a snap binder with safety cam. Made in USA by Columbus McKinnon of parts forged and assembled in USA. Effortlessly release this load binder without using any tools or prying - all it takes is one finger. Due to its unique design, the binder's handle releases the load at the same point every time - when the handle is perpendicular to the body of the binder. Low-energy release prevents the binder from snapping back over center. 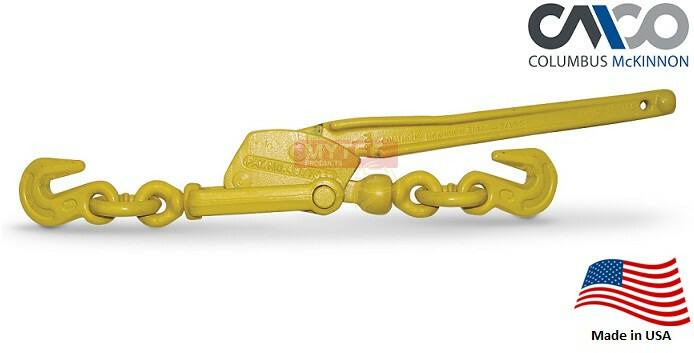 Free turning, 360 degree continuous swivel action in both tongue and clevis for enhanced straight line pull.